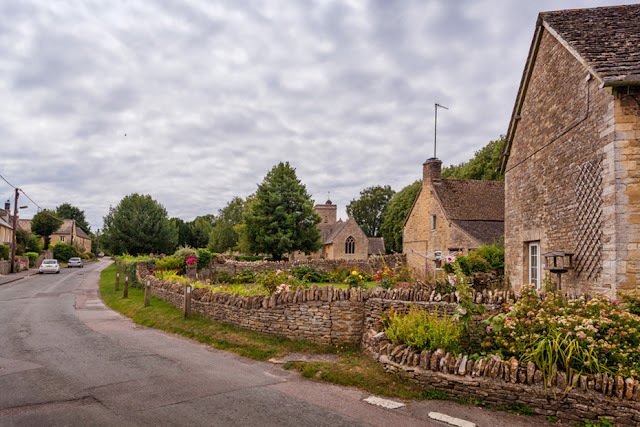 The smallest of the three Wychwood villages, the other two being Milton and Shipton, Ascott is the most isolated, and is set in a lovely location beside the quiet River Evenlode. The name 'Ascott' comes from the Saxon for 'East Homestead', a reference to the fact that Ascott began as a child settlement of Shipton, a few miles to the west. Wychwood was the ancient royal forest of Wychwood, and its name originated from the 'wood of a tribe called Hwicce'. Little remains today of the forest. Despite its very modest size, it's quite surprising to learn that Ascott has been home to two castles. During the Norman period, Ascott was granted to Roger d'Oyley, who built himself a castle in about 1129-1150, the east end of the village is in fact still known as Ascott d'Oyley. The castle was subsequently demolished and now only a fragment of it remains, the site of castle bailey is now occupied by the 16th century manor house, which is now a farm. But the earthworks can still be clearly seen from the public footpath by the river. The west end of the village is known as Ascott Earl (after an Earl of Worcester) and also had a castle - though this was probably only motte and bailey and today only earth mounds mark the site. Re-opened in 2014, The Swan had been closed for three years. The early 13th century Holy Trinity Church. The church was remodelled in the 14th century and the upper stages of the bell tower date from the 15th century. At the back of the church are five wooden pews which were for the old and sick and possibly are the oldest in Oxfordshire. which in the spring are carpeted with wild crocus. Ascott Village Shop is owned and run by the community. Ascott is also home to a Neolithic long barrow, which dates from between 3760–3695 BC. The barrow was excavated in the 1960's and the remains of 21 people were found within, along with finds of pottery, flint, axe fragments and animal bone. Stones from the barrow have been set up in the village to represent how they were laid. Stones from the Ascott long barrow. So while the village of Ascott may be tiny, it certainly holds a great deal of history. The next stop on our Cotswold tour will Asthall, another small but perfectly formed village, and also steeped in a great deal of history.